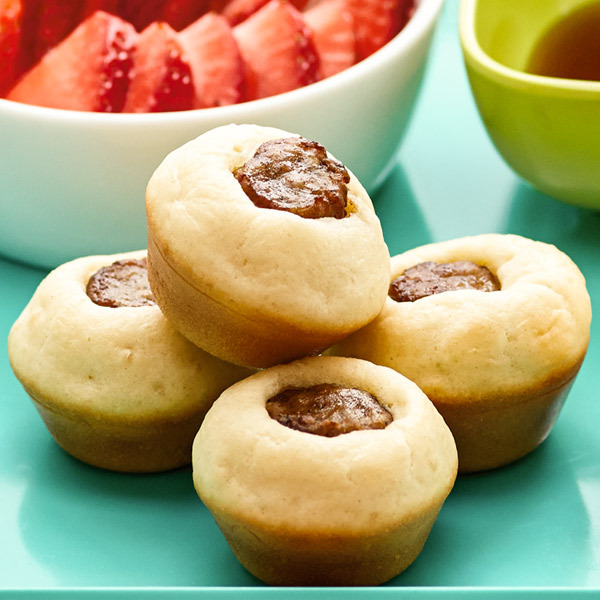 These cute breakfast treats are a bite-size twist on traditional Pigs in a Blanket. Using a baking mix like Bisquick, insert precooked sausages in a mini muffin pan filled with batter. Then heat up some syrup for dipping your Mini Pigs in a Blanket. Arrange sausages on a microwave-safe plate. Cover and microwave for 2 minutes at 100% power. Set aside. Mix baking mix, milk and egg. Whisk until combined. Add approximately ½ Tbsp. batter into each muffin cup (about ½ full). Cut cooked sausages into 3 equal pieces. Place a sausage piece in the center of each muffin cup. Bake for 8 to 10 minutes or until cooked through.